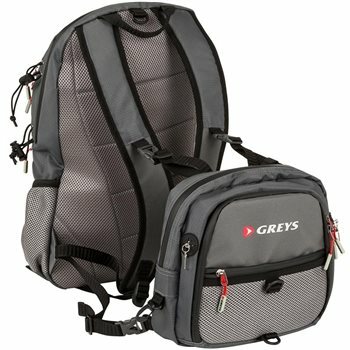 The Greys Chest/Back Pack is the ultimate accessory and pack for any angler on the go, containing multiple storage solutions for your gear, this is a dual chest and backpack in one, giving you the complete freedom of movement, whilst keeping all your gear close by. This pack includes a large backpack on your back, big enough for storing a light weight jacket and various other tackle items. The back panel on this pack is padded for additional comfort, along with shoulder straps for ease when carrying. There is two exterior water bottle holders and neoprene rod holding straps. The detachable chest pack on the front is ideal for smaller items such as your fly boxes, tippet materials etc. There is a detachable fly patch and the chest pack has a front mesh pocket with a zipped pocket at the front as well. You can use both packs and wear together or separately if desired using the quick click system to easily attach and detach the packs. The packs are both made from highly durable, rip-stop outer fabrics and both include multiple D-rings and swivel hooks to attach accessories. They also have multiple pockets for tackle storage and offer excellent storage space. The Greys Chest/Back Pack is grey in colour with red colour accents throughout and includes the Greys logo.